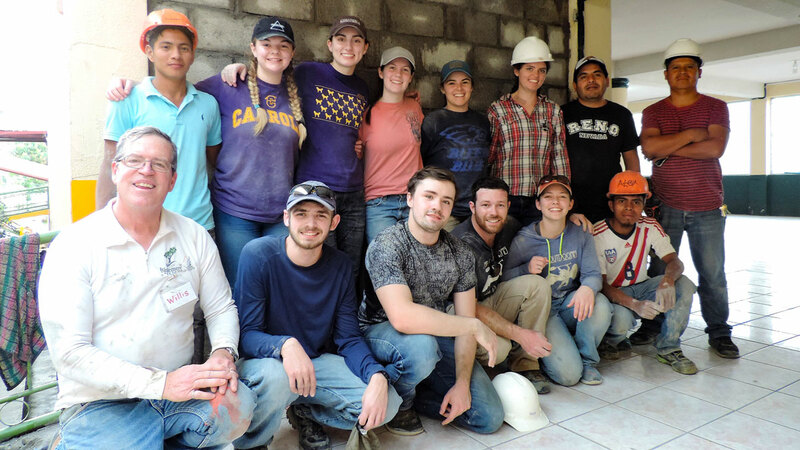 The Student EWB Guatemala team with Guatemalan friends after the completion of two retrofit structural walls in January 2019. The student EWB Guatemala team completed two more retrofit structural walls in January 2019. The Guatemala EWB student chapter has been implementing the construction of retrofit structural walls since May 2012. The project was inspired by the Haiti earthquake in January 2010, which was so devastating. After that seismic event, it occurred to us that the La Asuncion School near Santo Tomas was at risk for a similar catastrophic failure. Kurt Keith of Morrison Maierle, a structural engineer, provided the first preliminary designs and then in 2014 Michael Brennen, also from Morrison Maierle, has been the lead structural engineer. The student project leader for the past three years has been Trey Scofield who passed the baton to Amber Pickering, who is now the student leader. Dr. Willis Weight has been the faculty advisor since 2009 and has traveled eight times. In the summer (June) of 2017, after approximately 20 walls in the library building had been constructed, the area suffered from two significant earthquakes, a magnitude 6.6 and a magnitude 6.8. The retrofit structural walls held beautifully, as well has the library building itself, but many of the other buildings suffered significant damage. The Diocese of Helena conducted a Lenten campaign during the spring of 2018 and raised sufficient funds to fix over 15 walls of other buildings using the methods we taught them. They built these walls during the summer of 2018. As part of our trip, we conducted an inspection of the work completed during the summer of 2018 and found the work to match the quality that was hoped for. We are pleased to report that after they repair a roof on one of the building, the school complex will be well underway to becoming more seismically safe. The student team completed two more structural walls during January 2019. Four had never been out of the USA before so that was a very rich experience. We had an opportunity to immerse into the local Guatemalan culture, including a hike to a Mayan temple site, and a soccer game, where we tied the La Asuncion faculty team 3 to 3. Additional relaxation took place near Lake Atitlan where the students had the opportunity to do some shopping and take in local cuisine.